Wounded Warrior Dennis Leonard needed help tying up his shortened pant legs with cording. He didn’t want any cold snow getting up where his legs were blown off in Iraq where he served in the Army. 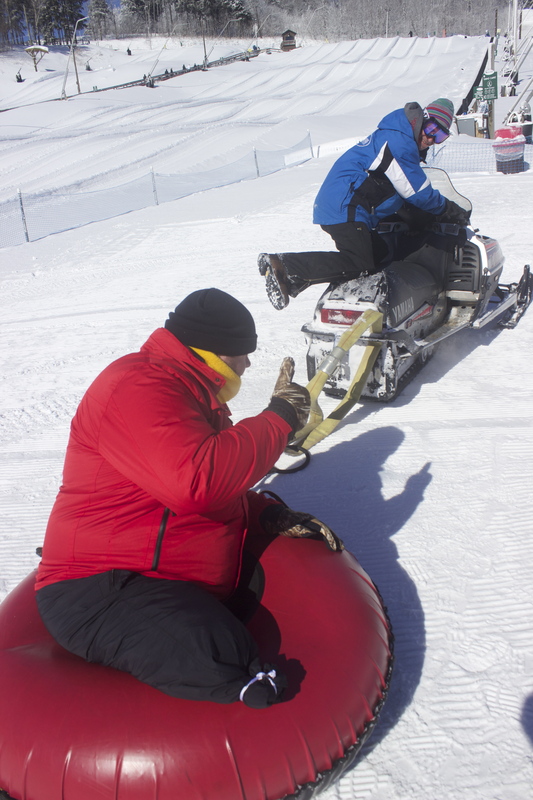 He was planning a wild time on the snow tube at Seven Springs Resort and nothing was going to get in the way of his fun. Although Dennis has both of his lower legs missing from an IED (improvised explosive device) explosion, he is into living large and going fast which at first thought, sounds unusual for a man in a wheelchair, but then Dennis is an unusual Wounded Warrior. 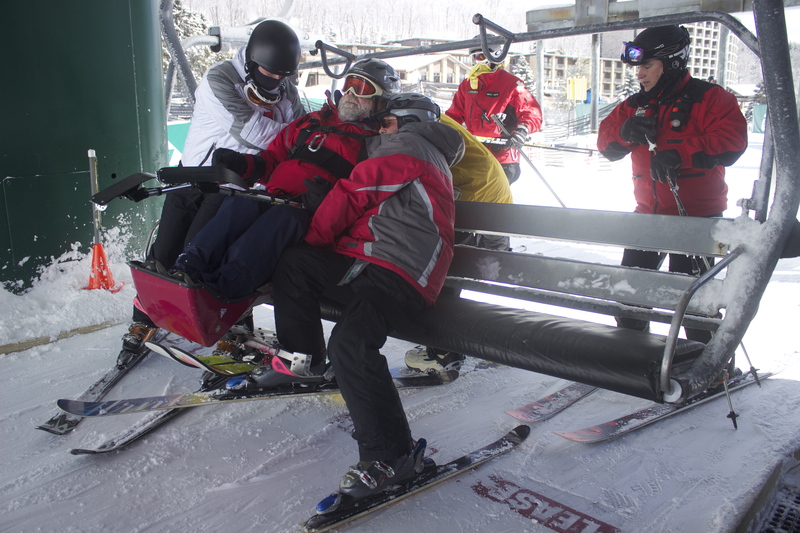 He gets help from the Ski Patrol team here at Seven Springs Resort and Ski Round Top in the Cumberland Valley outside Harrisburg. They are here with the Wounded Warrior Patrol, a non-profit organization based in Carlisle, whose mission is to gift Wounded Warriors and their families an all-expense paid ski vacation, to help aid in the healing. This 4 day event is co-sponsored with Seven Springs Resort in the Laurel Highlands of western PA. Eleven families have come to enjoy skiing, snowboarding, tubing, along with bowling, miniature golf, spa treatments for the Warrior’s wives, kids’ crafts as well as babysitting, and fantastic meals- a dream come true for these families. Nine of the eleven are from Pennnsylvania. I was planning on being in my own tube, since only single tubes were available, but also wanted to slide right with Dennis. He said he’d hold onto my handle so I could hang onto my camera and take pics. “I have you covered,” he replied. Dennis said, “You’re going to have to cover that part,” since he had no feet. “I got this,” I replied back. We were a team. He told me when he was sliding here last year on his own tube, a scout yelled to him to drag his feet as he was zooming very fast, “Right!” he yelled! Rising up. Isn’t that what an amputee would wish for and dream about the most, rising up? As so he makes it happen. Last year, Dennis tells me, the slope wasn’t fast enough for him. The jumps weren’t high enough. “Any time I can go FAST, I’m all over it. He raises hell on his 4-wheeler at home and hoists his body onto a tube on a lake and becomes airborne behind a motorboat. “First thing I want to do is find out how fast it can go.” He liked living on the edge. “It’s all about speed and having a good time,” he said. 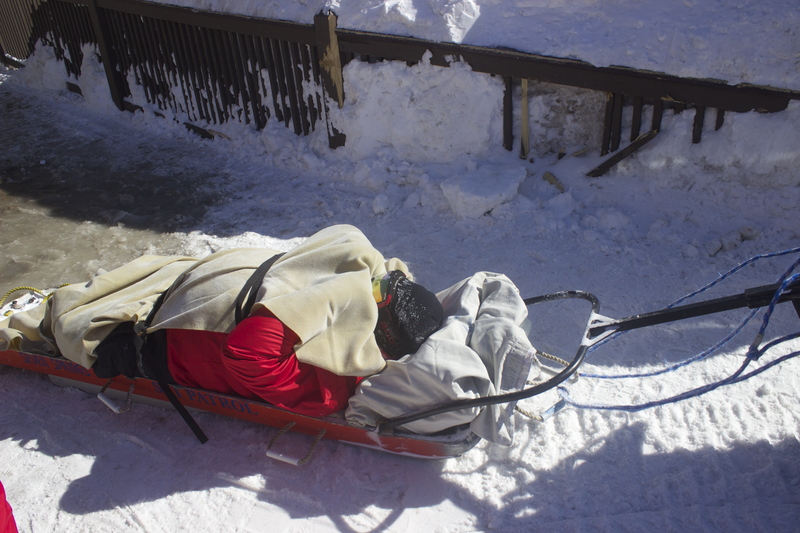 The next day they loaded Dennis onto a rescue toboggan, bundled him up in a “blankie” tucked around him and zoomed him up to the top of the ski slope. 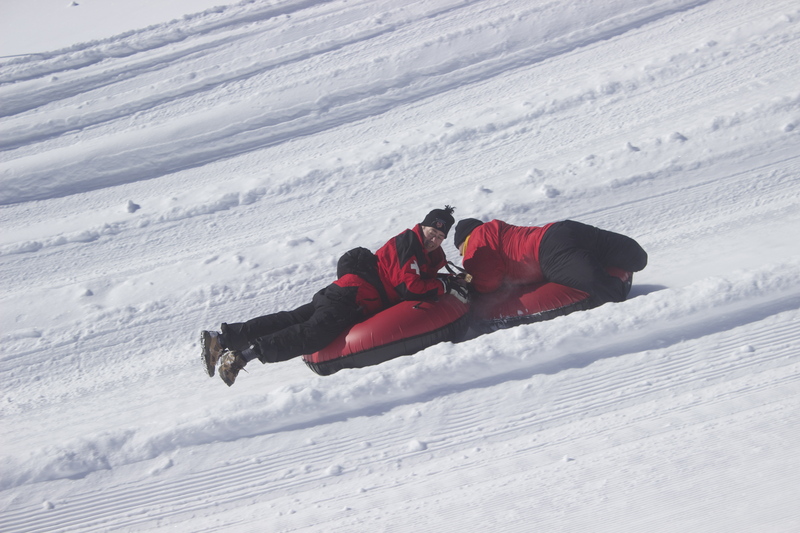 This time, he would careen down the mountain sitting upright on the toboggan. A skier from the Patrol team led him in front with two long rigid poles while another member of the patrol, had the rear on a webbing tether, so Dennis didn’t run his lead skier over. Everyone on the slope not associated with the program was amazed and stared and could almost not believe their eyes, as Dennis smoked past. The scene of Dennis flying down the hills was only one of many inspiring images here at Seven Springs this week. There were other contraptions made to take physically challenged folks racing down the snow slopes and one was a Ski Bike. Wounded Warrior Jeff Hemminger assembled his Adaptive Ski Bike together that first night we met at Seven Springs. He moved around with his intact and amputated leg, while his son, Tyler helped him. This soldier lost his leg in a Humvee accident from an IED explosion in Iraq. Jeff’s Ski Bike takes him to new speeds that he can’t get in his wheelchair or on his prosthesis. There are skis where there tires would be on a normal bike. 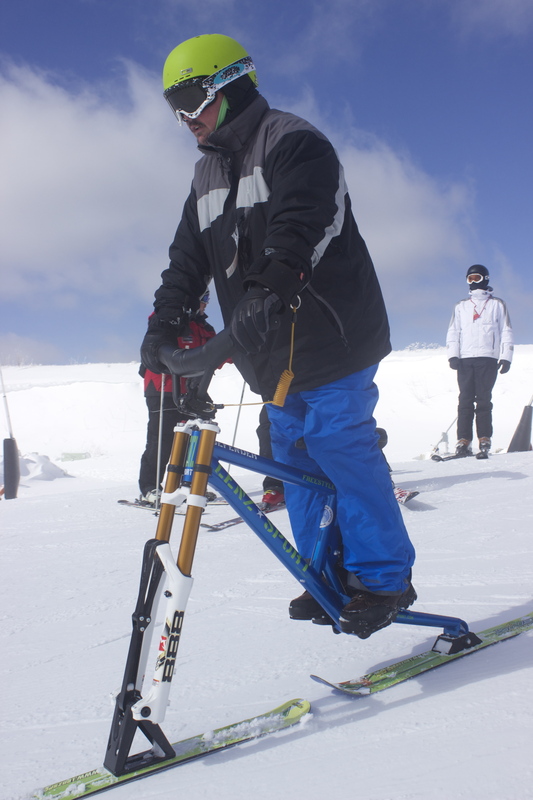 He rides the Ski Bike by standing up on the bike pegs keeping his legs stationary. The fork and the back shock is the same as mountain bike. 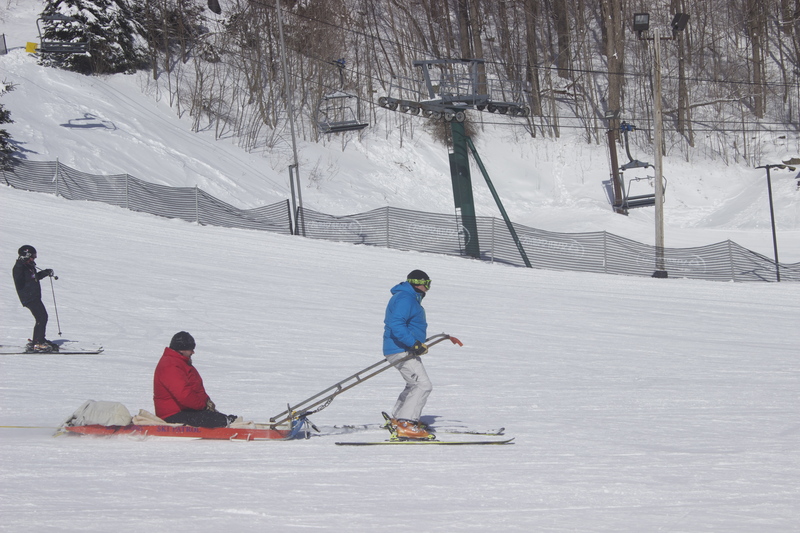 The Ski Bike weighs about 30 pounds and costs around $3,500. Ski Biking is a fairly new sport in America, compared to Europe where it is quite popular. Jeff travels to Telluride and Durango along with other places to participate in Ski Bike fests. But the most amazing contraption for me was the Sit Ski. 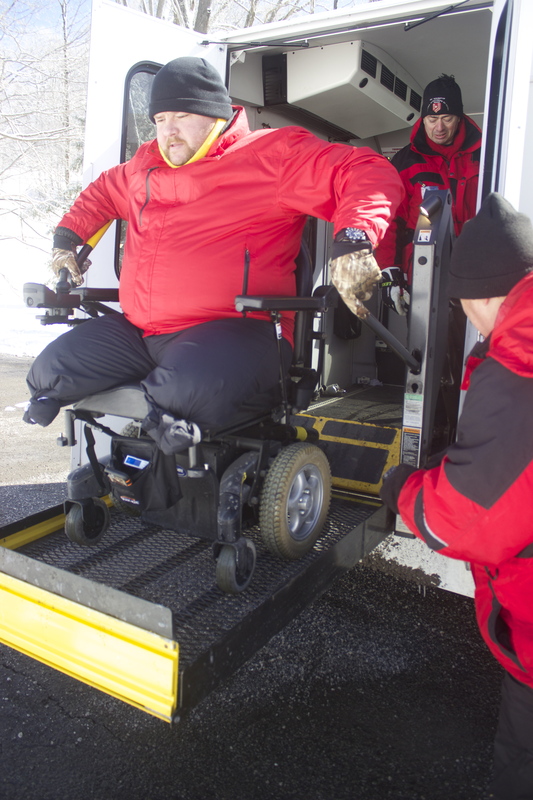 The Wounded Warrior sits in the chair and can either assist turning with two short skis that are strapped to their arms, or have outriggers on like trainings wheels which help balance and prevent them from falling over. 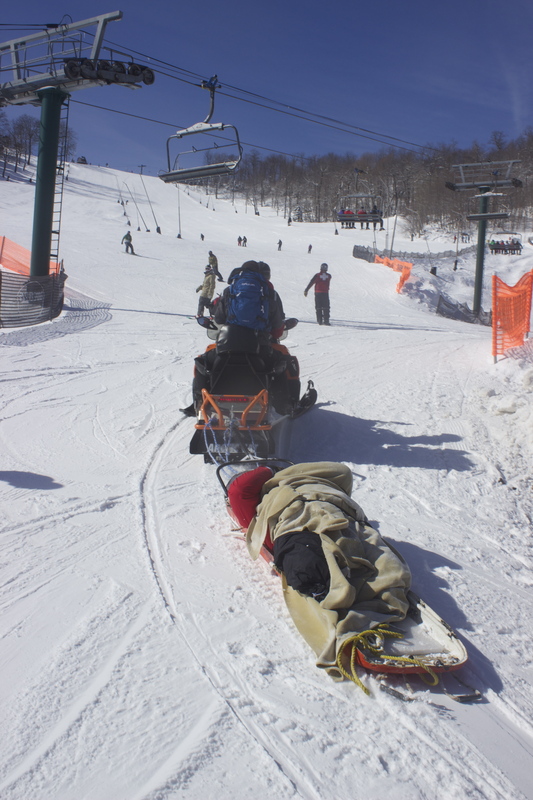 A skier from the Three Rivers Adaptive Sports program out of Pittsburgh skis behind and holds two webbed straps as a tether. He can control the Sit Ski, make it turn, slow it down, as long as the sitter does not do anything stupid. They asked me if I wanted to try it. How else could I write realistically about it if it was all speculation? I wasn’t sure I could prevent myself from doing anything stupid however. This was a week of trust. The Wounded Warriors trusting as they stuck their necks out, got out of their comfort zone and safe homes. Just coming to this event, for starters, was a stretch for them with strange people, many people, unfamiliar surroundings, new challenges. They are being asked to engage in scary new sports that could threaten and intimidate anyone who is unfamiliar with the ski world, let alone Wounded Warriors with trust issues and most suffering from Post-Traumatic Stress Disorder (PTSD). It was a lot for them to deal with and they had to put their trust in the Wounded Warrior Patrol. I may as well practice it myself. They strapped my body in the Sit Ski using multiple straps. I could barely move. Lean a bit, that was it. They pushed me over to the chair lift and multiple men picked me completely up in the Sit Ski. 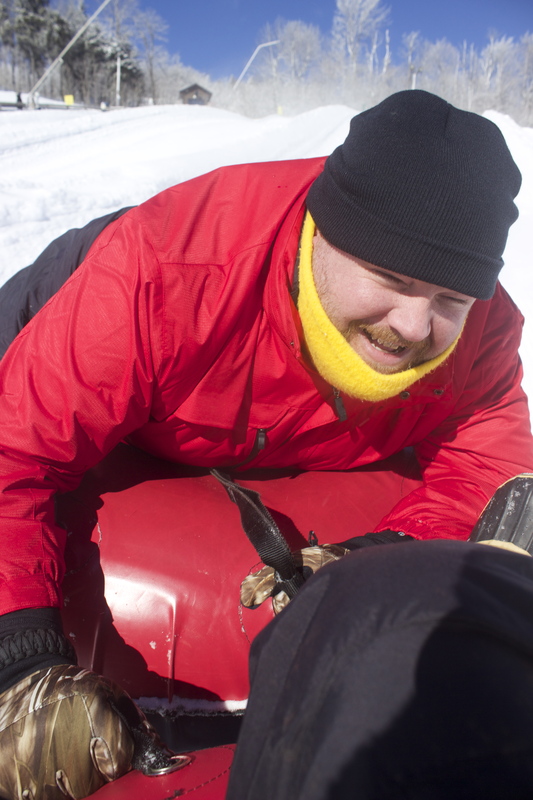 “Ready?” LIFT!” I became airborne, they tilted me back and hoisted me onto the moving chair. They pulled the bar down. I had to trust them. Up top, I was given instructions. I was pretending to be a Wounded Warrior who could not use their arms or legs but could still move their torso. So I was to lean hard left and right, slight left and right when I was told to do so. I had to find my balance point. I started off wigging and wagging until I FELT it and could manage it. 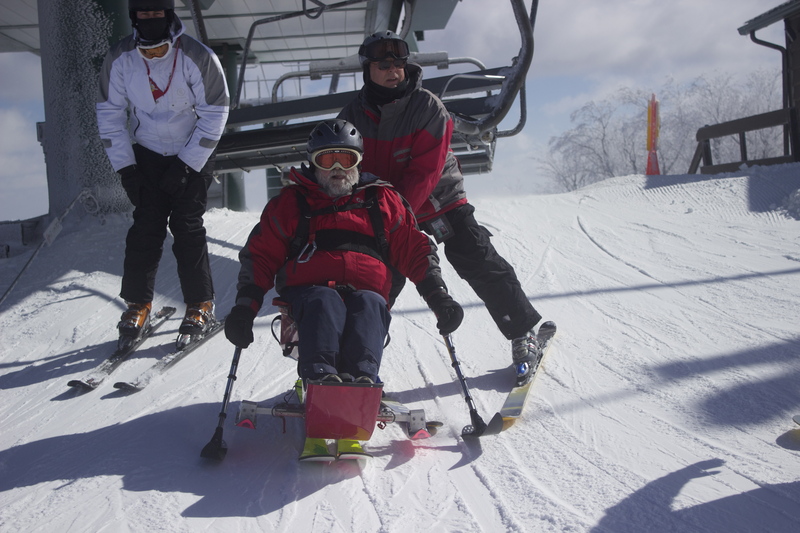 My instructor, Clark Manny has been safely teaching and escorting physically challenged people down ski slopes for over 20 years. I felt safe although vulnerable. I also felt physically challenged! The steep slope rushing towards looked like a disaster ready to happen- the sharp turns, the other skiers, the light poles etc. all zoomed into view. I had not skied since I was 18 years old in high school. I was not familiar with a ski run. But we made it and it was fascinating to see how we could work together. Next time, no training wheels and I had skis strapped to my forearms. I had to assist. I had to hold them out and point them left and right. Keep contact with the snow. Right off, I started wigging and wagging again, feeling like a kid trying to balance a bicycle for the first time. Clark was working hard. Twice he saved me. “That will cost you a beer,” he announced. He “saved” me again. Another beer. And two times he could not save me and I fell completely over on the slope, taking multiple men to pick me up and set me straight. I was beginning to see the huge commitment and sacrifice these adaptive skiers make in order to get immobile folks mobile again while speeding down the slope and having a blast. It was very challenging for even someone like me to Sit Ski, let alone a real physically or mentally challenged person. 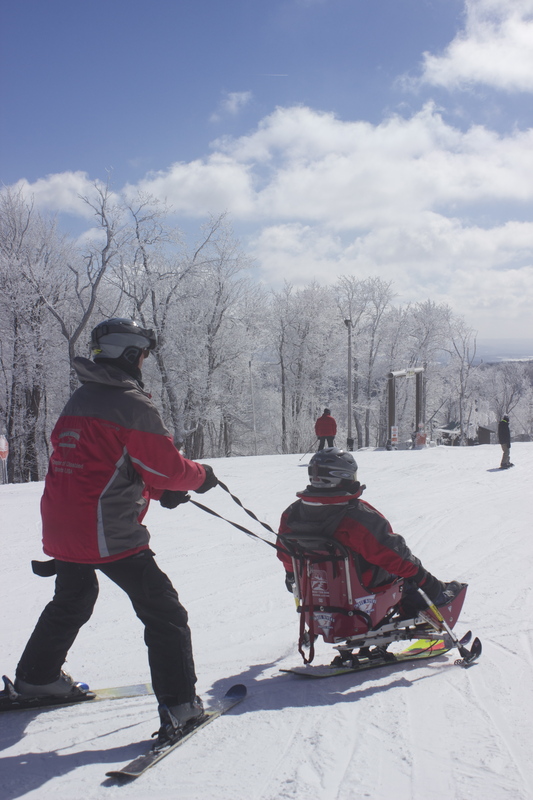 Adaptive Sports takes all ages, all challenges down ski slopes- MS victims, ASL, cerebral palsy, paraplegic. Every person is different and it runs the gamut of who can move which body part or who can understand and who can communicate on all varying levels. Even a person whose body permanently leans to one side, they can compensate and get that person skiing. It is tremendously rewarding to see the work that they do and the joy that they bring to otherwise immobile people. And above all, how these Wounded Warriors are learning to heal and live again. Dennis Leonard told me after the week was drawing to a close, that he was never into whining about his missing legs. “Stuff happens in your life and you deal with it.” Some Veterans don’t deal so well, but what saved Dennis is his attitude. When someone questions if an activity is going to be safe for him he looks at them crooked and replies, “What, am I going to do, hurt myself? I’ll slow down when you put me in the grave.” Good advice for us all. 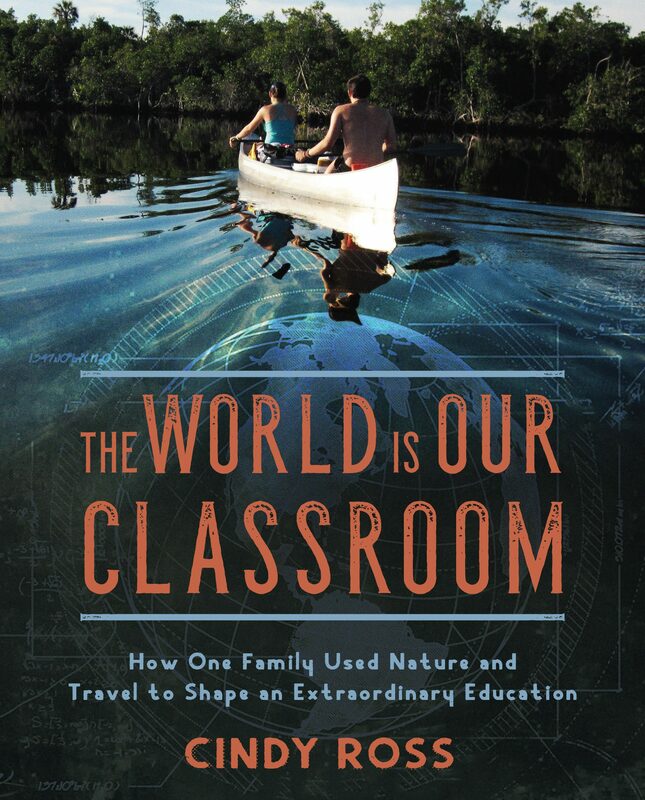 Another great article Cindy! Thanks you for ALL you do on behalf of our wounded veterans! thank you Bob- come out and hike /play with us sometime soon! Great story!! Loved it!! And love you! oops, I meant Dennis Leonard.